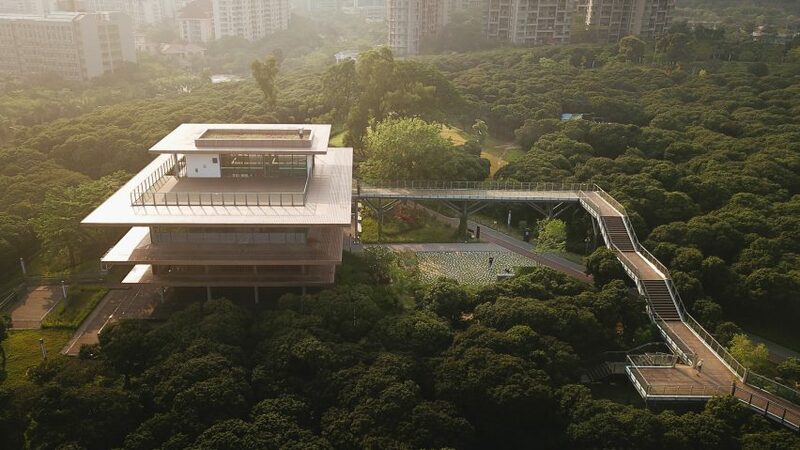 Cantilevered metal roofs shade the glazed walls of this library designed by MLA+, which is connected by a treetop walkway to Shenzhen's Xiangmi Park. 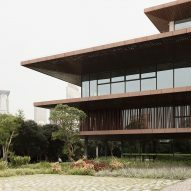 Global architecture studio MLA+ designed the Xiangmi Science Library as part of its masterplan to regenerate Xiangmi Park, which is found in the Chinese city's central Futian District. The park was originally used as an agricultural research centre, but was engulfed by the rapidly expanding city in the 1980s. 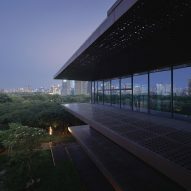 Since then, the research facility has overseen the preservation of the park's key features, including a large lychee orchard, fish ponds and an avenue of palm trees. The masterplan developed by MLA+ focused on retaining many of the 45-hectare park's existing elements, while introducing new buildings and landscaping features that promote the use of spaces for both recreation and education. 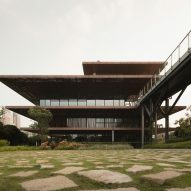 As with the other new and refurbished buildings in the park, the Xiangmi Science Library is intended to sit unobtrusively within its surroundings and encourage users to interact with nature. 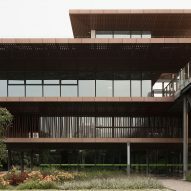 "Rather than being an intrusion, [the buildings] are devices that reveal some of the qualities of the local natural environment," the architects said. 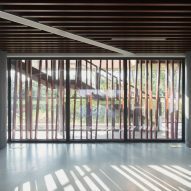 "In doing so, they stand in the tradition of classical Chinese garden architecture and at the same time they are activators in a contemporary and accessible new open park." 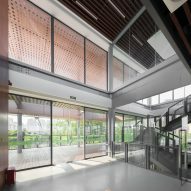 The science library is designed as a visually lightweight pavilion nestled among the trees, with a steel framework and glazed walls accentuating the building's permeability and connection with the park. 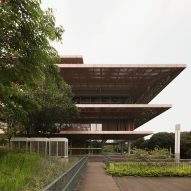 The glass facades are protected from the sun by large cantilevered roofs made from powder-coated metal that are design to reference local vernacular architecture. 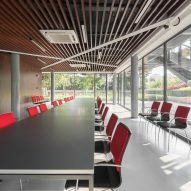 The building contains a meeting room, reading room, main library, a terrace and administrative offices, with the public areas situated on the upper levels to make the most of the views. 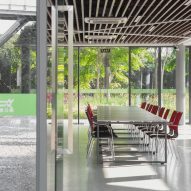 A terrace on the second floor is connected by a bridge to an elevated walkway that extends through the treetops, emphasising the library's secondary function as an observatory and transition zone between different features within the park. 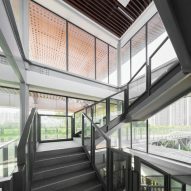 "The library is also a public staircase, which serves as a connecting element between the level of the bridge with the ground floor," added MLA+. 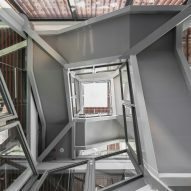 "Perched in between the trees, the building offers an ever-changing experience of its surrounding landscape, which varies from floor to floor." 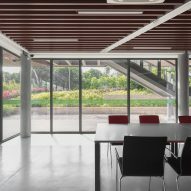 Gardens and landscaping surrounding the ground floor extend right up to the glazed walls, so this level feels like an extension of the shaded forest floor. 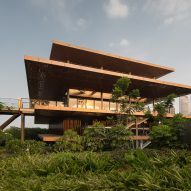 The first floor, which is aligned with the canopy of the trees, is given a more intimate and enclosed feel by a screen made from irregular slanted metal struts evoking the forms of the surrounding tree trunks. 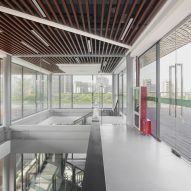 In Aalst, Belgium Kaan Architecten has recently extended a 19th century school to create the Utopia building, which contains a music school and library. Photography is by Vlad Feoktistov.